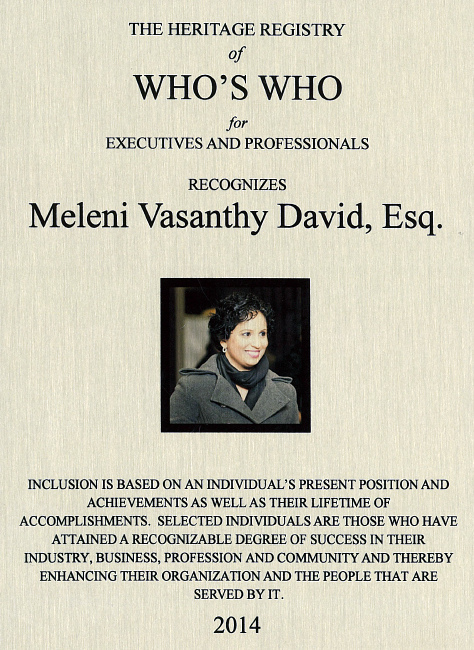 Lawyer, mother, and entrepreneur extraordinaire, Meleni David is an astonishing woman. 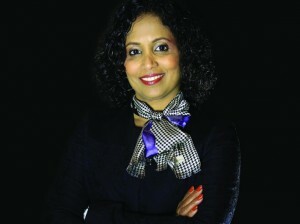 Coming to Canada from Sri Lanka in 1995, Meleni overcame a set of challenges as a mature student at Osgoode Hall Law School, simultaneously managing the family duties and law school. 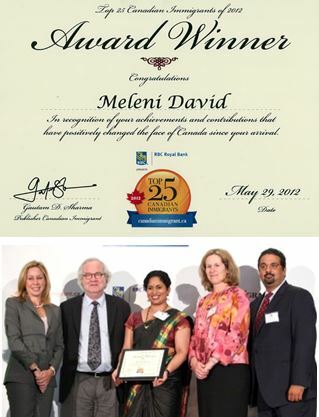 Meleni is a recipient of the Top 25 Canadian Immigrants of 2012 Award. 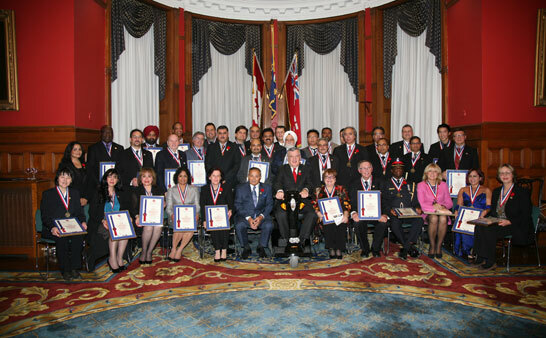 Recently she received The National Ethnic Press and Media Council of Canada Award from the Lieutenant Governor. Even during such a busy time, Meleni found the time to speak about her life as a newcomer, a businesswoman, and a mother. VH: You’re an incredibly accomplished person! How did you get your career started? Did you always have an interest in law? I had a passionate interest in law from a very young age: my aunt and uncle worked as lawyers and the whole community respected them, and I grew up admiring them very much. VH: What informed your interest in pursuing personal injury law? Honestly, it was purely a coincidence: my interest was in immigration law and family law – I wanted to help my community. But when I started articling, I landed at a personal injury firm, and enjoyed working in that field. Through this experience, and throughout law school, I realized that my community was more in need in this particular field as well. TH: You’ve faced many challenges growing up and early in your career; do any events during these years motivate you towards producing social change as a lawyer? Good question! 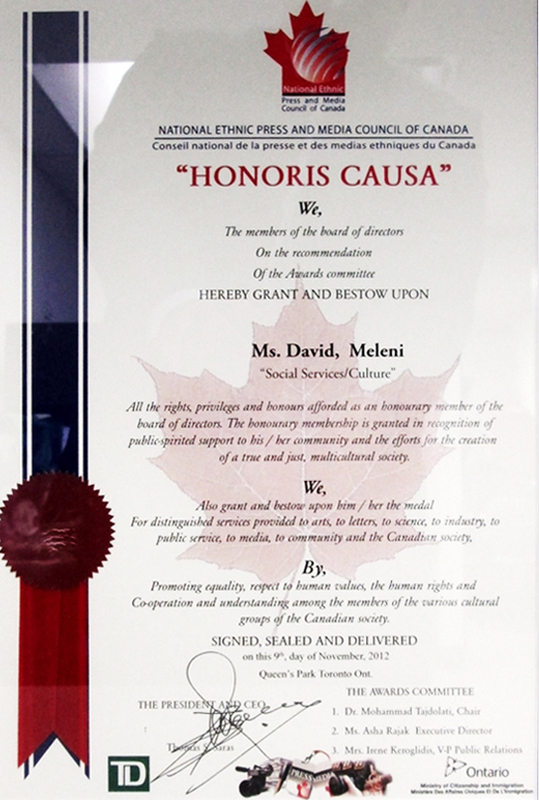 Yes – I was very motivated towards producing social change. From the beginning, I felt many wrong things were happening in the world, and I really wanted to get involved change things . But then, I had to stop and think about my personality: when I do something, I put my everything into it, all my time. I can’t commit a little bit, or spread things around. So I thought: I can enact social change, but it will be at the expense of serving my community in the largest scale; So I accepted that I can’t help with everything. I will do what I can and my first priority is my community. VH: Before coming to Canada, you studied law in Sri Lanka, before the educational institutions were closed down – what was that experience like? This is sad for me to talk about…terrible things were happening, and I had no control over them. Our exam papers were lit on fire as we waited for our final exam – things like that, they leave scars. Like I said, it’s quite upsetting. I had no say or control over my situation, and it was sad and depressing for many others as well. So many people couldn’t finish school. I got married and started a family. When I moved to Canada, I had the urge to start again – I felt more determined. I believe I’m one of the blessed ones who found something here. So many people from my country who came to Canada couldn’t finish school, depending on their personal situations. VH: After leaving school in Sri Lanka, what was it like transitioning into a role as a full-time mother? And how did you manage to juggle school, work, and children, all at once? It was a challenge – my children were so full of energy, I had to keep up with them! I thought: my priority was my children, and my family shouldn’t miss out on anything just because I went back to school. I didn’t want my children to miss out on their childhood, because they will never get that back. So I sacrificed a lot, also my husband, my parents, my family all helped me. Basically, every day, I woke up at 2 or 3AM to finish my schoolwork. Yes; 3-6AM was the time I got for myself. My girls were 4 and 6 years old then, so when they woke up I packed their lunches, and I brought them to school. Next, I’d go to work: I worked as a supply teacher during the day. Then I’d come home and make dinner. I was exhausted by then, and I’d put the children to sleep and would fall asleep myself by ten, and start it all again the next morning. I would sit and study while my children played in the park – everywhere they went, I went. It was a challenge, and it was quite emotional at times…my daughter, when I went to the library once, wrote me a note saying: “it’s like I have no mother and Dad is taking me everywhere.” But now my children understand and appreciate the time that went into it. Going to York, I had to keep a high average to get into law school. There was so much pressure, and I don’t know how I did it. But that’s me: I can’t sit and do nothing, I have to be on the go. I have been a self motivated person all along – I motivate myself to achieve what I want in life. VH: Studying at Osgoode Hall, did you feel your status as either a mature student, or a newcomer, shaped your experience, or the attitudes of your classmates towards you? I went into Osgood not expecting a lot: I aimed to finish what I set out to do and get out, but it actually turned out to be an extremely pleasant experience. I made very good friends, and some ended up working with me – one for seven years! I never felt excluded or treated different as a mature student; I was one of them. I think these days, most law schools have more women than men. So did not feel the pinch as a woman….I didn’t feel any discrimination as an immigrant, either; because of my friends, and within months I became one of them. VH: Can you talk a little about the inception of the firm? How did it feel in the beginning? It felt like everything just fell into place! When I came out [of law school,] I doubted I would even get an articling job, but immediately after graduating I got one though some people wait for years for an articling position. I did set up my practice prior to being call to the Ontario Bar. On the day I was called to the bar, I walked in to office to start practicing. I felt a sense of accomplishment, as I always wanted to have my own practice, like my aunt. I also wanted my own practise because of my children: when you have your own practice, you are able to keep your own hours – so this flexibility was good for caring for them. Also with God’s blessings I inherited little over 100 files from a paralegal firm right before I started my practice, so I had clients right from my first day. I set up the business, I walked into the office, and that was that. VH: Tell us a little about your decision process: why did you choose Canada – and why Toronto? Did you consider anywhere else? We couldn’t stay any longer in Sri Lanka, so we urgently had to leave. We did consider the US, but somehow I had the inexplicable feeling that, coming from Sri Lanka, Canada would be warmer, nicer. I also chose Toronto because my brother-in-law who lived in Toronto and encouraged us to move here. VH: You mention in a bio that, as you eased into your career, your status as a woman made you feel a discriminatory “pinch.” Can you speak to this experience, and perhaps to a potential gender bias in legal world? When I started my career, I didn’t know our firm would grow into such a big practice! At the time, most lawyers in the community had smaller practices. I received some negative treatment from male agents in my community who were actively involved in my area of practice: at the time, many agents who weren’t regulated by law society were doing personal injury law. In my community, not everyone is fluent in English language, but most agents were, and they follow them aggressively. Promises of income replacement benefit, with wild figures like $1000 per month – there is no such thing. Their information wasn’t accurate, but they openly advertised with in-accurate information and people in vulnerable positions believed them. I, on the other hand, spoke only the truth and stated what each person was legally entitled, and so these agent’s inaccurate information had a negative impact on my business. Perhaps I felt a ‘pinch’ with male lawyers in my community too…big names like Diamond and Diamond, Franklin Hall LLP– they’re all men. I remember thinking: I’m playing with these big guys, with their wealth of experience – not to mention their enormous billboards and ads! Sometimes I felt like I wasn’t given a fair chance in the field, but eventually I earned my community’s trust, and began teaching the difference between lawyers and unregulated agents to my community. Agents are more regulated now, but some are still active and not regulated. They’re attracting less and less people now, because our community understands. So, for the first 1 or 2 years, yes, it was hard and I was intimidated – but the intimidation only made me more determined to succeed in the field to chose to enter. VH: Did you encounter any difficulties with the immigration process? None. Everything was peaceful; it was a smooth process towards becoming proud Canadian citizens. VH: Maintaining your legendary career must be incredibly fast-paced and packed with daily challenges – how does a typical workday look for you? How has it changed throughout the years? Initially it was me doing everything, but I now have 35 members of staff, so the amount of work for me is greatly reduced. Basically I do all the administrative work: the wages, dealing with the banks..etc… This does reduces the time I can spend on client files, but I make myself available for first initial meetings with clients and also whenever clients requests for a meeting with me. There are four lawyers and two articling students on staff, and everyone does a great job. I always tell my staff that I am nobody without them – they run the show. There is no Meleni David without them. So we start at 9am, and everyone comes in at 8:55. We all take a 30 minute lunch break. Everyone is highly trained and left on their own; I say to my friends, if I go away for a year, everything will be fine. They’d just need me to sign the checks! I feel like I’m so blessed, and the more blessings I receive the more I feel compelled to give back. I want to share my blessings. VH: Did you feel that any of the challenges you faced throughout your career were based on your status as a woman or non-Canadian? If so, could you briefly discuss one? In the beginning of my career I felt discriminated against as a woman, but maybe it was in my mind! I sensed it a lot with those male agents. I’ve never felt discriminated against as an immigrant – but my English has always been very good, and that probably helped. VH: You’re an inspiration for internationally-trained professionals – in your experience, what do you feel is a key challenge facing international professionals? The system, primarily: it’s not very accommodating to internationally trained professionals, and I know it’s not helping international professionals ease back into their professions. You’ve been the cream of the crop in your country, but when you come to Canada, you face hardship. Everyone hears about doctors workings as cabbies – it’s so wrong. At the same time, a small part be on their fault as well; you might argue they’re not determined enough. I’d say, OK, 25% is them: if they’re fleeing war, and they want to escape to a peaceful country, and the only thing they want is a peaceful life that’s fine; but if you want to be recognized as a professional in Canada, you have to work to get what you want, and in Canada, you will get there if you’re determined. It’s easy to fall behind and not make succeeding your priority. It’s easy to settle with whatever you have. VH: It goes without saying that many people look up to you! When you were starting out, were there any people whose careers or lives you felt mentored/inspired by? My aunt, who works as a lawyer and acting magistrate in my country, was my role model. I always wanted to be like her – she could walk into a room and immediately demand respect. I watched her carefully. I was proud to be a woman because of her, and I wanted to be a lawyer because of her. She still lives back in Sri Lanka – she’s is in her 70’s now, but she still looks very smart. VH: What has been your proudest accomplishment to date? The number of people I’m able to employ, definitely. Where I started in Canada I was a sales girl, and so where I am right now is an accomplishment! I am able to employ over 35 staff, and I am proud to say I am significantly contributing towards the Canadian workforce and Canadian economy. VH: What’s your least favorite aspect of living in Canada? How about your favorite? I don’t know if I have a least favorite aspect of living here! Fast food joints, maybe? Canada is so peaceful. We came from a war-torn country, and now have a peaceful life in Canada. You don’t feel fear here, and you can live a steady, settled life which I am very grateful to have. VH: Do you have any advice for newcomers looking to find rewarding work in Canada? I would say my husband is a great example for that! 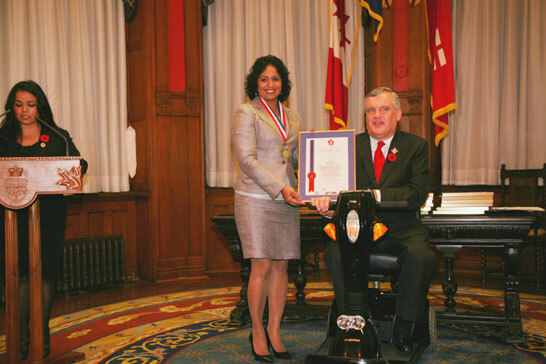 He knew he didn’t need to waste time studying; he believed that he had the education that he needs, he had worked for Nestle in Sri Lanka, and was determined to get into the Canadian branch here. He kept calling and calling, offering to work for free. Eventually he got his foot in the door as a customer service representative, and now, after 14 years – after many promotions along the way – he is currently holding a position as a Trade Marketing Manager. So like I said, there’s lots of opportunity here in Canada if you study or work hard, and go after what you want. In Canada, the sky is the limit; the country offer many services for newcomers, so make use of all of that. I believe that, with the right mindset and 2-3 years of focused work and sacrifice, anyone can upgrade their career realize their full potential in Canada.